I don’t know how this will go. I bought a 28 year old bike, poured some money into upgrades, and now its for sale. I suppose it might take just the right kind of buyer for me to get the value of the bike, plus most of my upgrade cost, in a sale. But that’s how I’d like to start. 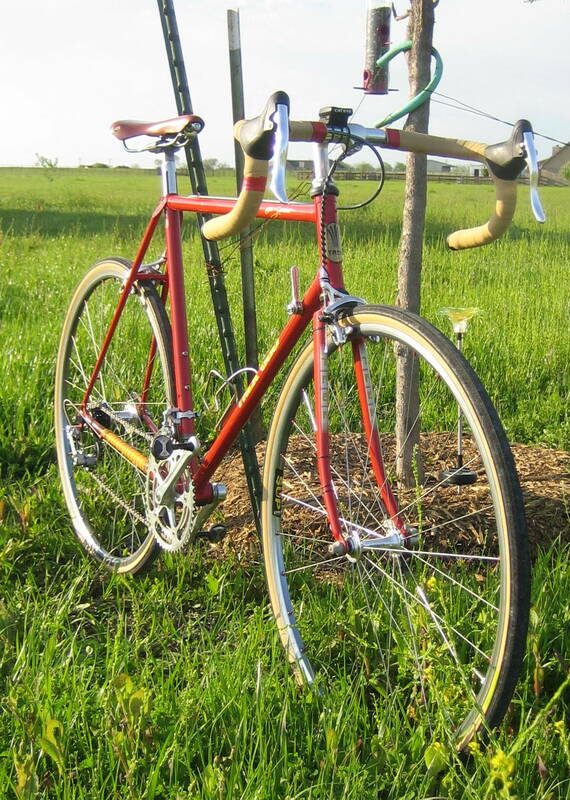 Since I’ve added nicer wheels, brakes, bars, brake levers, cables, much nicer tires, and a spendy saddle, I’d like about $850 for it. We’ll split the shipping. It’s not in perfect condition. It’s got a few scratches that have been touched up, a little rust (also touched up) in a couple of spots, but no major dents or dings. It rides very nicely, however, and it comes with a pretty nice looking Campy Nuevo Record drive train (rear and front derailleurs, crankset, and shifters). I might keep the pedals and the computer, but everything else shown is included. I suppose if someone is looking for some kind of a bargain, I might need to take some of the newer, more expensive bits off and sell those separately. 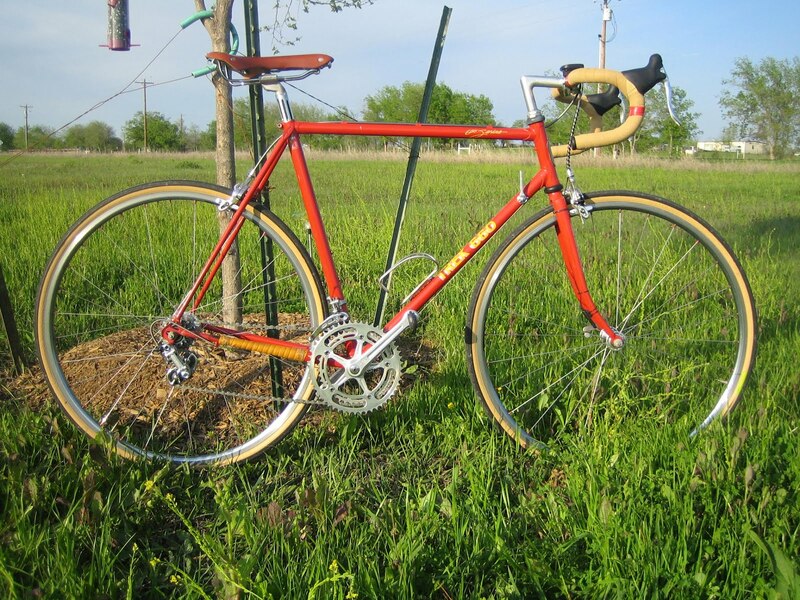 This would be a good bike for someone who would enjoy a classic road bike that performs very well to do spirited rides. As shown, it weighs just under 22lbs (according to my bathroom scale). This might be a little more than the modern road bikes you might be able to buy for about $1000 at your local bike shop. But my guess is that this one will perform better. Maybe its just me, but I think the lively feel of old school steel is delightful. I’ve got a lot more details if anyone is interested. I’ve got a copy of the Trek brochure from 1984 with the frame geometry. I can provide a more detailed parts/build list, and I can take measurements and photos upon request. So $850 firm then (plus 1/2 shipping), unless of course you want to negotiate. What size is the frame again? According to the brochure, 56cm seat tube (center of BB to top of seat tube), and 56cm top tube (center to center). Tempted. However, I think I need a slightly larger frame size. Also, there's the wife factor. dickdavid, let me know if you'd like to look it over, check sizing, etc. I'll meet you somewhere. Not having to pack and ship might qualify for a "local buyer discount".Remember, it's red, and that's pretty fast. I want to ride where ever you took those pictures. the wind rain snow and gunk in my part of the world is grating on me. I have a question. You've no derailleur hanger there do you? I am doing a slow build here on this end; do I need a hanger or is it an optional feature? Wilson, in my third photo from the top, you can almost see that my rear derailleur is bolted to a tab that extends down from the rear frame drop out. It is integral to the rear dropout. 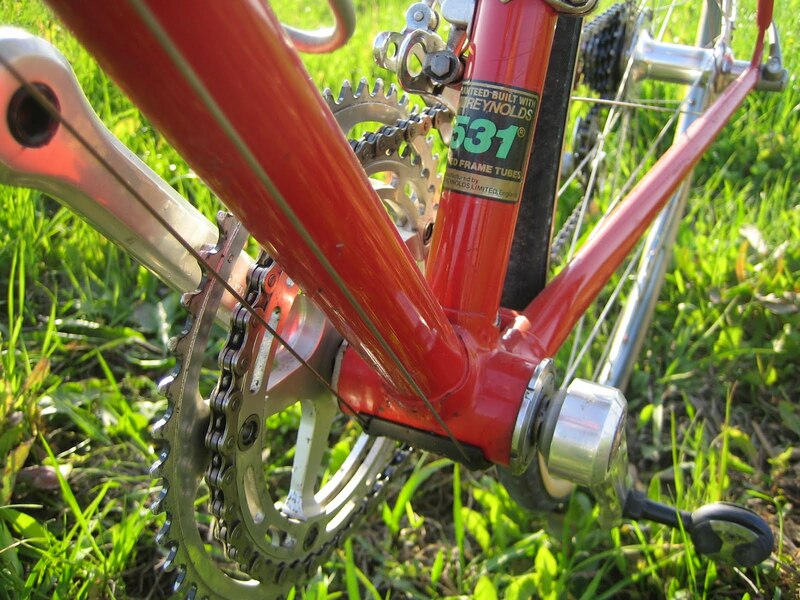 Frames designed for rear derailleurs commonly have such a tab. 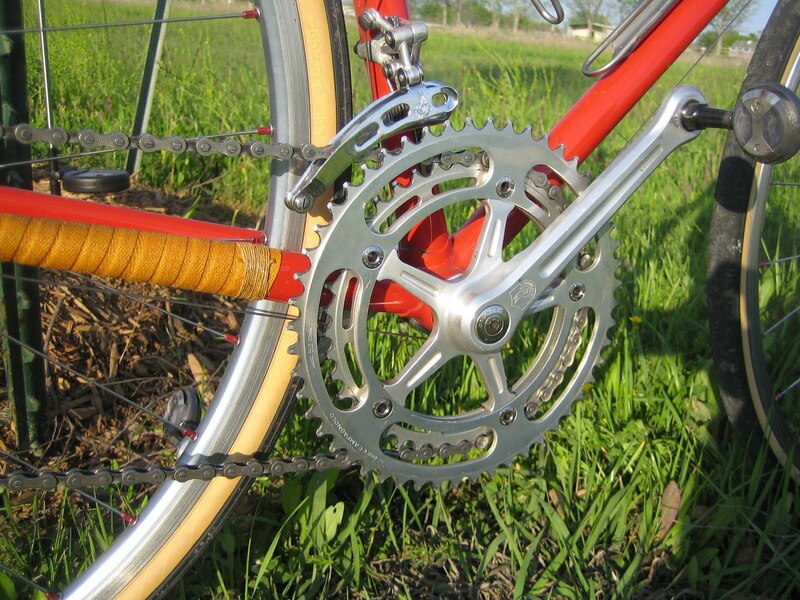 Whereas frames designed for single speed commonly do not. Does this answer your question? Or did I miss your point? That does indeed answer my question. Thanks.I thought all bikes "required" a hanger, but my research (and your answer to my question) has shown me that its not the case.You see, I presently have one bicycle and it has an aluminum frame. I have come to learn that all such frames need the hanger because it provides the weak point in case of overstress. 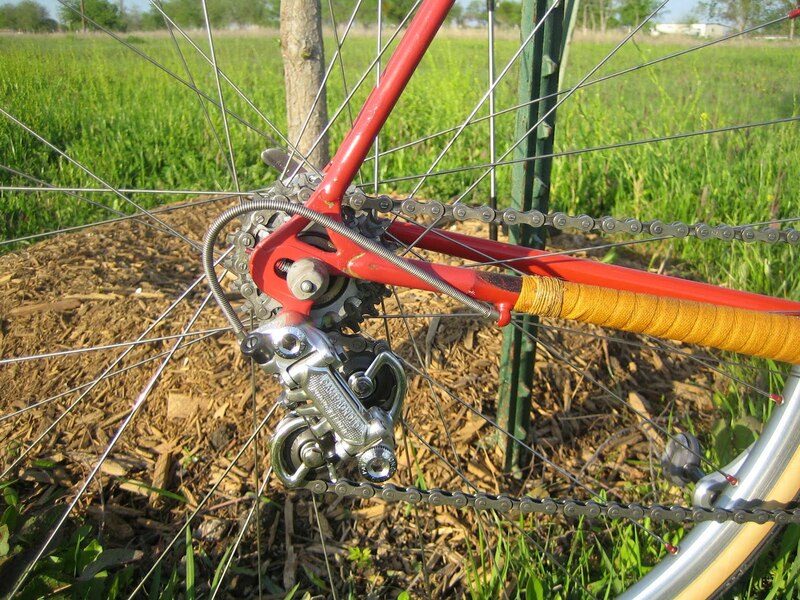 However, the frame I am building is steel and doesn't need the hanger (it has the tab).Thanks for your reply. This whole BLOGing community is really teaching me a lot.Cheers.